The LEGION chamber will allow Fans to enter the mind of a sane man in an insane world. The exhibit opens at Goya Studios in Hollywood on March 30. 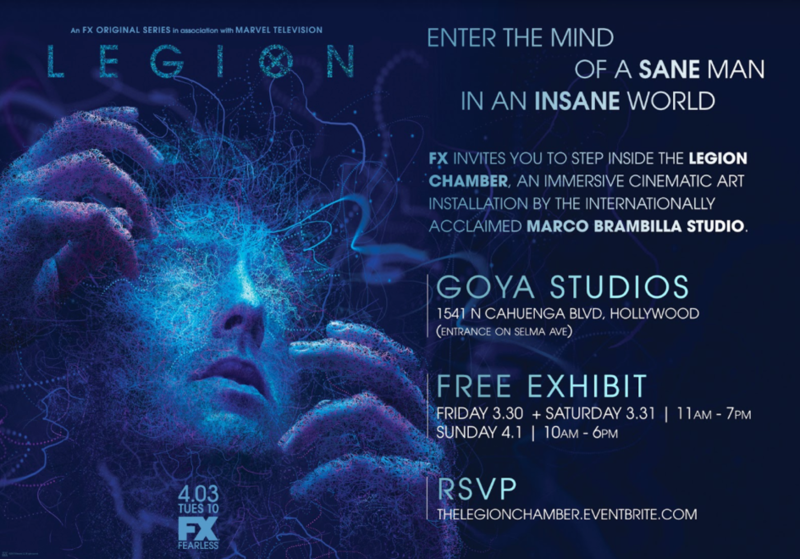 LOS ANGELES, CA (March 26, 2018) – FX Networks today announced the arrival of The LEGION Chamber, an artistic video installation inspired by the FX drama series Legion which allows fans to step inside a 360-degree micro-theatre featuring a one-of-a-kind presentation by the internationally-acclaimed Marco Brambilla Studio. Once inside, participants will find themselves disconnected from the outside world – literally – and fully entrenched in the hypnotic digital realm of Legion’s David Haller. Hosted at Goya Studios in Hollywood March 30 – April 1, this extraordinary visual art piece will take fans on a surreal journey through David’s altered states of reality forcing them to question what is real and what is not. For more information on how to experience The LEGION Chamber, go to facebook.com/legionfx. For more information on Goya Studios, check out their blog.